There are some who are ruled by circumstances and there are others who rule circumstances. Nila Devi Shah clearly belongs to the second group. She may not have liked that tiny village of Pipliya in Pali District where she had to stay to take care of her husband’s grandparents but that did not stop her from becoming the agent of change. Mother of three sons and two daughters, grandma to 14 and great-granny to 3, she has instilled kindness and compassion in their hearts. Along with her sons and their wives, she has changed the destiny of that village. Free medical service, mobile vans, medical camps of large sizes – she does the Rajasthani community proud with her zeal and dedication. She looks so silent and content that on first glance, it is tough to see the dynamic energy that drives her. But once she starts speaking, even though the calm tone stays unchanged, yet the breadth of information she has on her fingertips and the fantastic capacity to convey it logically makes her one of a kind. She knows the names of each and every doctor, where they come from, their duty days and specialization, and speaks of them as family. A diligent social worker, a compassionate activist, a large-hearted leader, and a selfless giver. Yet she remains an unsung hero, a fact that escapes her attention, so engrossed she is in what she does, so immersed in her compassion, that nothing else matters. In fact, she expresses surprise and delight at being interviewed. She speaks confidently and thoroughly, in a Hindi mixed Rajasthani dialect, in her brother’s house in Chennai where she is visiting just now. Tell me about your origin. I was born in Bhavaal village of Rajasthan but grew up in Madurantakam near Chennai. I had my primary education and was married at the young age of seventeen. I still remember that a huge gathering had come from the groom’s side for the wedding – almost 350 baraatis. Why and when did you move to Pipliya? Was it for business reasons? After our marriage, we lived in Ahmedabad for five years. By then, my husband had established cable factories in Chennai, Delhi, Bangalore and Ahmedabad. He decided to move to Pipliya to take care of his grandparents. There, he set up a cable factory, a machinery-manufacturing unit, and also started the PG Foils Limited, a company which manufactures aluminium foils. Did you initially object to staying in a village? I don’t think any of us ever thought like that. Objection was never an option. Life was tough there with no water and no electricity. I had grown up in a city and found it very different. But we stayed on. Now looking back I am glad we did that. He was kind-hearted and since there was no health centre in Pipliya at that time, whenever anyone in the village would fall sick, he would send them in his own vehicle to Byawar. He always assisted the sick. When did he pass away? What was the inspiration to start the hospital? He passed away in 1982. He met with an accident and we could not get medical assistance on time. My sons resolved to start a hospital in Pipliya. All of us simply assumed that I would play an active role in it. 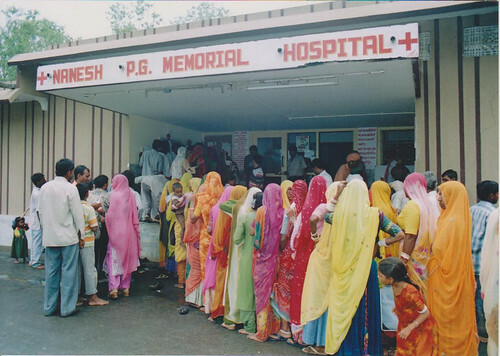 We started the Nanesh PG Memorial Hospital in 1984. It is my life’s vision and mission, I cannot imagine life without it. How did the hospital evolve? It must have been tough to find professionals who would be willing to come to such a remote area! That’s true, for 7-8 years, we hardly found any doctors. Then a couple of them came from Delhi and Jaipur for almost two years. Today we have five mobile hospitals and more committed doctors. Many of them make weekly and monthly visits, and are like a family to us. Some of them charge us only for travel. Apart from this, we also have doctors to perform various operations including plastic surgery. We also conduct blood donation camps annually where more than 1500 people donate blood. 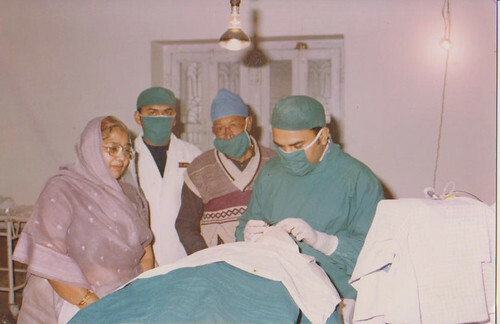 In March every year, on the death anniversary of my husband, we organize a free medical camp. 3000 people attended the camp last year. Are all the medical services available free to the villagers? Yes, almost free. Even though everyone advises me to the contrary. The largest challenge we faced is that the patients would not bring back their prescriptions on their next visit. So now we charge them Rs 2 and Rs 5, just to ensure that they take their health seriously. You may find it hard to believe that even such a token payment instills responsibility. How do you manage the facilities for your in-house patients? The hospital is well-equipped and as far as the food is concerned, everything is prepared in our own kitchen at home. For in-house patients, doctors and staff. It is a warm feeling which is further enhanced by the fact that each and every person there calls me ‘Mummy-ji’. Kindly tell us how you have undertaken to empower the village women by buying spices from them and sending these to your close ones all over the country. I discovered that the spices prepared here were fresh and pure. They also enhanced the taste, colour and aroma of food. Initially, I used to buy the ingredients and pound them at home for my own consumption and for some close relatives. Slowly others who knew me also began to ask for them. Now, thousands of kilograms of spices are being sent to many relatives and friends. The village women are happy because it is a good source of income for them. I feel a sense of satisfaction that both the sides are benefitted. So when you are travelling, who pitches in for you? My daughters-in-law are very supportive to me in all my endeavours. I am able to pursue my religious interests and other social activities simply because of the cheerfulness at home. A word about changing times! I don’t think time has changed, priorities have changed. The younger generation now values freedom more than anything else. And is that an easy demand to meet? When I want to be free, why tie anyone else? I believe that if you give them what they value, they will respond likewise. Many of our relatives express surprise that my children and grandchildren are happy having Pipliya as their base. But with modern conveniences of travel and everything a click away, I guess Pipliya is no more the remote place it once was. First published in January 2013 in Harmony – Celebrate Age Magazine for the column – The Great Granny Diaries. Part-2 of this post is Dal ka Seera, a Rajasthani dish prepared in winters from the kitchen of Nila Devi Shah. She is the fifth grandma featured in this column.